Why have I waited so long to try Agatha Christie?! I absolutely loved this book and need to read more of her! A group of people, unknown to each other, have been invited to Indian Island all for different reasons. Strangely, none of the individuals personally know the presumed owner but somehow that doesn't stop any of them from making the journey, first by train and then by boat. The members of the group are all strangers to one another, except for the husband/wife duo who are the hosts and act as butler and cook. A framed nursery rhyme of The Ten Little Indians hangs over the fireplace, which is an important piece of the story. After the first evening's dinner, the guests find out the real reason why they are all there. A recording addresses the guests and names them one by one, with accusations of each one being responsible for having killed or causing the death of someone. The guests think it is preposterous and a sick joke until, one by one, they are bumped off. Wow, this book deserves ten stars! What a clever mystery!! I loved the isolated setting, and the suspense and anxiety that built up as each person because suspicious of the others and the fear of who would be killed next. 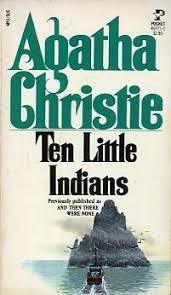 This is my first Christie novel, but it won't be my last! 5 stars!! It was superb, and I loved it. I will likely reread it. You should definitely put it on your TBR if you enjoy mysteries! Agatha Christie is THE BEST. This is probably my favorite book by her, I'm glad you enjoyed it! Great review!